Creativity in presentation and multiple options for interaction. Multimedia, interactive exercises, and serious games engage participants. Ease of continuous quality improvement. Amount of time and type of participant interaction is anonymously collected on the back end. Ability to rapidly update to ensure consistently cutting edge content. We can revise or update rapidly in response to new scientific evidence and insights. E-learning can be completed at a time convenient to the participant and can accommodate all members of an organization or organizational unit. Greater probability of true organizational change. Group change is most likely when all members can participate in learning experiences that increase understanding of the need, nature and direction of change. Uniquely promote learning through high engagement and low threat. Live training can create anxiety or sense of threat in participants, especially with difficult topics such as exclusion and inequality. We increase felt need, engagement, hope and motivation and reduce negative emotions, distress and disengagement, through the use of tone, imagery and sound. Ability to link personal behavior and lived experience to systematic inequalities. 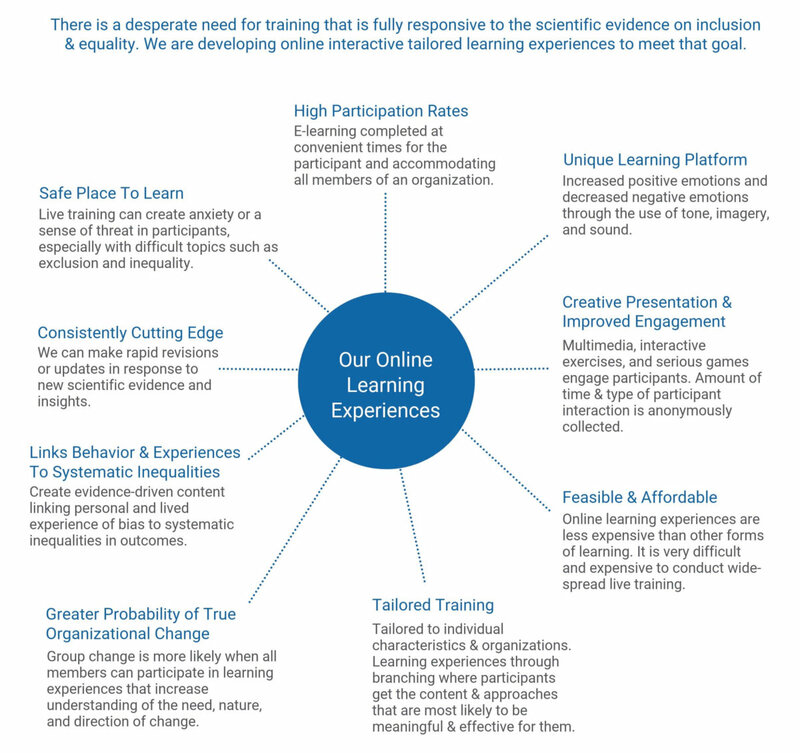 The flexibility and variety of type of learning experiences allow us to create evidence-driven content that links personal and lived experience of bias to systematic inequalities in outcomes. Ability to tailor to the individual learner, the organization, and/or the learners’ role. Tailoring to individual characteristics: Using branching we can send participants to the content and approaches that are most likely to be meaningful and effective for them. Tailoring to organization: Using organization branding, images and specific scenarios increases relevant and sense of connection. In addition, we have used data from our organizational inclusive climate assessment to make the training maximally relevant to participants. Tailing to role and job content: Bringing new concepts and approaches alive by tailoring examples and exercises to specific job content increases relevance, engagement and learning. Ability to rehearse new skills in private. It is feasible and affordable. Online learning experiences are less expensive than other forms of learning in both direct and indirect costs. It is very difficult and/or very expensive to conduct wide-spread live training.